Contributor – Entrepreneur Media Inc. 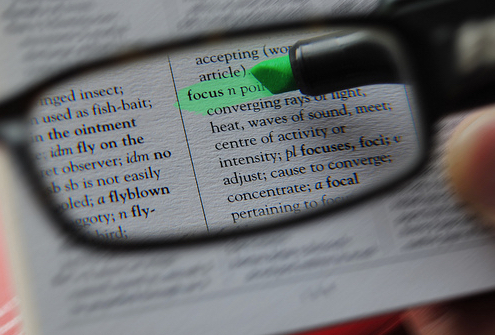 If you have a difficult time focusing on one thing at a time, you're hardly the only one. As legendary video-game programmer John Carmack once said, “Focus is a matter of deciding what things you’re not going to do.” The main problem for most business owners is not only that they do too much, but also that they do too much. Multitasking makes it extremely difficult to properly focus on any one item. Here's an exercise to prove it. First, recite the alphabet from the beginning. Then, count backwards from 100 to 79. Not so easy is it? Why is that? Because most people, when trying to do two things at once, do both of the tasks less effectively than if they did them separately. As a savvy business owner, would you knowingly hire employees who are poor performers? Of course not. So the question is, why do you attempt to do more than one task at a time and do both poorly? Many business owners just can't let go. When they first start their companies, they often have to do everything. There isn't anyone else to pitch in. So, they become good at some of those obligations and perform others fair to poorly. With hard work and persistence, their businesses begin to grow. They hire more people to do some of those tasks, but still hold most of the control. At various times they might even take a step back to work right alongside their employees. Although that sounds altruistic, most times, it just isn't a good idea. Having to control everything means you start to lose your control over everything. Learn to delegate some of your tasks to someone else in your company. It will allow you to focus on more important and productive responsibilities. Another reason is that many business owners lack an effective way of determining which tasks are important and which ones are urgent. This results in an endless journey of being surprised by and having to put out fires as a daily routine. When I begin to work with my new small business clients, the first thing we do is have them create an Action Board. In a nutshell, an Action Board is a visual tool you use to track all projects from their inception to completion. By monitoring and working this board daily, it is amazing how much you can get done by being able to prioritize and maneuver your project list. Whichever system you use to determine which of your tasks are urgent or important or both, make sure you use it on a regular basis. Once you learn how to stop doing everything at the same time and focus your energy on specific projects, you will experience a feeling of real control. When that happens, you will be on your way to a better, more productive experience.